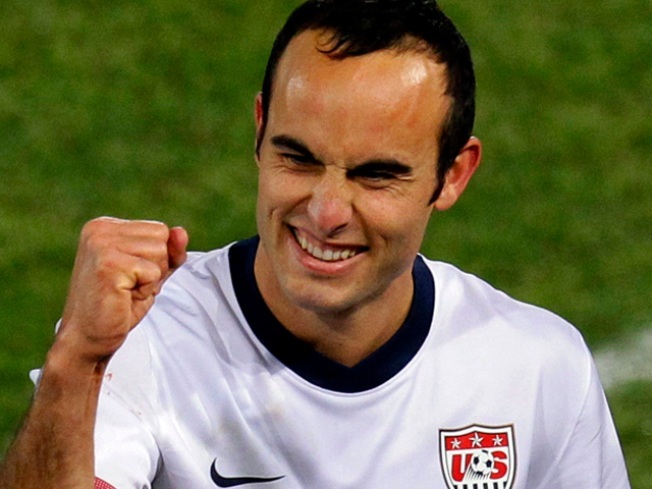 It appears that the rumors about Landon Donovan fathering a love child were a bit premature. During a red-carpet interview with E!News at the ESPY Awards in Los Angeles, the soccer star revealed that he's not quite ready to be called daddy yet. "I actually wasn't sure I was going to asked but I know now that I will not be a dad any time soon, which is good news for me," he said. "You just broke the story." The day following the USA's ouster from the World Cup at the hands of Ghana, British tabloids buzzed with the news that a U.K. woman was pregnant with his child. Donovan, 28, was on loan to Everton of the English Premier League for a portion of the season earlier this year. At that time he didn't deny the accusation, saying that he would provide "appropriate support" if the child was indeed his. Donovan has been separated from his wife, actress Bianca Kajlich, for a year, but there were signs that the couple was starting to reconcile while in South Africa. After Donovan scored the dramatic, game-winning goal against Algeria, he blew a kiss to her in the stands and they reportedly shared an emotional phone call later that evening.